Wladyslaw Szpilmans Warsaw Ghetto Memoir of 19391945 appeared in 1998. Initially in Germany but soon in all continents, publishers became convinced of the necessity to make this unique document about the Shoah accessible to the public. Through Roman Polanskis award-winning film The Pianist (2002), which is based on Szpilmans book, the authentic story of this Polish musician of Jewish origin reached an audience of millions, winning three Oscars. Death of a City was the original title of Szpilmans book (first appearing in 1946 in Poland) about his survival through the Second World War in Warsaw under German occupation. Immediately after the war, under the vivid impact of his sufferings, Szpilman gave an account of the hellish ghetto, of the deportation of his family into the death camps of Treblinka which he himself had escaped (due to the fact that he had been recognized as a famous musician and picked out of a crowd of deportees). He also told of the solidarity of Polish friends who had risked their lives to shelter him after his flight from the ghetto, until he was saved from starvation shortly before the end of the war by the German Wehrmacht officer Wilm Hosenfeld in an almost totally destroyed Warsaw. Far from being politically correct, Szpilmans book, however, quickly fell victim to the censorship rules of the new communist regime. After the horrors of the Shoah, a German officer was not to be portrayed as a saviour and Polish and Ukrainian collaborators who had taken part in the annihilation of Polish Jews were not to be named. Therefore half a century needed to pass by before the book could (thanks also to the initiative of Szpilmans son, Andrzej) finally receive the historical place it deserved. However, the real personality of Wladyslaw Szpilman was so much more than the charming, dazzlingly good-looking pianist of the Polish Radio in the thirties that the book and film portray him to be. It is time the artistic output of this Orpheus polonicus, whose work had a profound impact on Polish musical life for decades, and yet whose name remains absent from music dictionaries, was recognised. Credit must therefore be given to his extant compositional work, now being brought before the public for the first time in this Boosey & Hawkes Edition, and which conveys an idea of the versatility of his talent, a talent that had to remain in internal exile owing to political circumstances. Born in 1911 in Sosnowiec, Szpilman initially received his musical training at the Chopin Academy in Warsaw, where he studied piano with Alexander Michalowski and Josef Smidovicz, first- and second-generation pupils of Liszt. Like so many other Polish musicians, he then felt drawn to Berlin where he perfected his skills with Leonid Kreutzer and Artur Schnabel, and, as a composer, entered tutelage of none other than Franz Schreker. He then returned to Poland in 1933 embarking on a brilliant career as a soloist, while performing as a chamber music partner of such famous violinists as Henryk Szeryng, Roman Totenberg, Ida Händel, and Bronislaw Gimpel. By 1935 he was the house pianist of the Polish Radio. In this function he played a Chopin recital on the 23rd of September 1939 in the last broadcast by the radio station. Part of this recital was the Nocturne in C-sharp minor, the piece that he would later play for his rescuer Hosenfeld, and that would reopen the service of the Warsaw station in 1945. After the war Szpilman played a significant role in the rebuilding of musical life in Poland, directing the music division of the Polish Radio until 1963. In 1961 he founded the first Polish popular music festival Music Knows no Borders in Sopot. After his traumatic experiences during the war Szpilman was forced to discontinue his solo career as a concert pianist owing to a slight nervous condition. However he recorded numerous solo programmes for the radio and performed as a chamber music partner, most often with the violinist Bronislaw Gimpel with whom he founded the legendary Warsaw Piano Quintet in 1963. As the only existing chamber music formation of its kind they gave hundreds of concert tours throughout the world until 1986. Szpilmans great passion from the start had been composition. Judging from the extant works it is more than deplorable that the largest part of his work composed before the war was lost in the destruction of Warsaw, including a violin concerto that had been performed by Roman Totenberg, Bronislaw Gimpel and Konrad Winawer. Handwritten copies of works might one day turn up in an archive or a personal estate, as was the case with the piano suite The Life of the Machines, written in Berlin in 1933. This copy was found in Los Angeles in the personal estate of Jacob Gimpel, Bronislaws brother. After the war Szpilman himself had reconstructed the last movement of this work, the Toccatina, from memory. He had done the same with the Concertino, completed in 1940 as the gates of the Warsaw Ghetto closed (and recorded 1948 and 1968 by the Polish Radio Symphony Orchestra under Stefan Rachon), and also with the Waltz in the Olden Style composed in 1936, re-constructed in 1968 and supplemented by a new coda. Szpilmans Mazurka, composed in the style of Chopin for a Revue, bears witness to musical life in the ghetto when such was still possible, and had to stand in for the real Chopin, whose music (a symbol of Polands struggle for national and cultural independence) the Nazis had categorically forbidden. The Paraphrase on an Original Theme is a series of Jazz-variations written in 1947 on a song composed before the war. Some of his most beautiful childrens songs published in the 50s were compiled in three Suites after own Childrens Songs. In the Introduction to a Film Szpilman used material that he had composed in 1957 for a Polish-Czech film production (in which Roman Polanski had appeared in a minor role). The Little Overture was commissioned by the radio in 1968 while the Ballet Scene from the same year, originally intended as dance music for a fairy tale by Grimm, received its premiere as a concert piece. During Szpilmans lifetime all of these works, the Waltz in the Olden Style, the Concertino, the Paraphrase and the Little Overture were only played on the radio  never as a public performance. On the initiative of Schönbergs grandson Randol Schoenberg the Concertino received its first public performance on April 29, 2001 in Los Angeles by the Jewish Symphony Orchestra under Noren Green with the young soloist Arthur Abbadi. The Waltz and the Little Overture received their first live performances as part of the Szpilman Memorial Concert on September 10, 2002 in the Warsaw Philharmonie under the direction of Antoni Wit. Within their biographical context Szpilmans surviving orchestral compositions are rather disturbing in their expression of lightheartedness and affirmation of life, contradicting what we are accustomed  and allowed  to listen to as music related to the Holocaust. We ask ourselves how he could possibly have worked on his Concertino in the ghetto, where he witnessed the most horrible crimes committed by people against other people on a daily basis. But today we know of so many composers, musicians, artists and poets imprisoned in the ghettos and concentration camps, and who through their work created an oasis of defense against the permanent assaults on their human dignity by the Nazis. In his introductory note Krystian Zimerman speaks of the positive energy of this music, about its almost resurrection-like character. And indeed: we witness in Szpilmans compositions  also in his piano performances  an energy that originates neither in the gut nor in the intellect but stems from the centre of life itself. One seems to be able to sense that certain élan vital that sustained him throughout the years of permanent mortal fear and physical sufferings. With the exception of the piano suite from 1933, which is related to the repetitive mechanical style of Honegger, Antheil, Prokofiev and Mossolov, Szpilmans music is situated between the poles of popular and serious music. Most importantly his music is not confessional and it rejects grandiose rhetoric or grand gestures. Instead of epic breadth we find concentration of material (the Concertino lasting ca. 12 minutes is the longest of the extant works), instead of depth of feeling we find ironic refraction. Szpilman loves to masquerade, to play with idioms which, as in the Concertino, can sparkle kaleidoscopically. Here the pianist-composer, with tongue in cheek, evokes the masters  such revered musical personalities as Chopin, Rachmaninoff and Ravel  only ultimately to reveal his kinship with his contemporary Gershwin. An example of music about music is the Ballet Scene which juggles familiar but nevertheless stylistically incompatible icons of ballet music. It seems as though Debussys Faune has strayed into Stravinskys Sacre. Szpilmans music, like his piano playing, is marked by strong rhythms and traces of dance-music. In Paraphrase, which is a veritable compendium of advanced jazz harmony, Szpilman swings in the big band style of the 40s, while pursuing artistic mimicry in his Waltz in the Olden Style: as the American journalist Robert Everett-Green aptly remarked, this is ballroom music which used only to exist in Hollywood, when Jewish exile composers such as Erich Korngold and Max Steiner were setting the tone. Each of these works is prototypical and indicates the multiple directions Szpilmans talent could have taken after 1933, had he been able to follow the path of many of his Jewish colleagues and settle in American exile instead of returning to Poland; indeed, Szpilman might well have become the Polish Gershwin, a description often applied to him. Just in time for the U.S. premiere of Roman Polanski's award-winning film The Pianistwhich is about the extraordinary experience of the late Wladyslaw Szpilman (see Classical Score, page 12 and Billboard, Nov. 23)Boosey & Hawkes has signed an agreement to publish the music of the famed Polish classical pianist/composer whose catalog includes several previously unpublished orchestral works, solo piano pieces, and some 500 pop songs. Twelve of the songs came out last month on the Hip-O CD Wendy Lands Sings the Music of the Pianist Wladyslaw Szpilman. B&H's first Szpilman publication, slated for early 2003 release, will be a print-music companion album of the same 12 songs, complete with the new English-language lyrics. "Listening to Szpilman's songs and orchestra pieces of the '30s and '40s, you'd never guess that they were written under the most harrowing conditions imaginable," says B&H's Steven Swartz, speaking, of course, of the several times that Szpilmana Jew living in Warsawnarrowly escaped deportation to the Nazi death camps. "The life-affirming spirit that helped him to survive gave vivacity to his art as well. His music is charming, effervescent, and strikingly American in style, with echoes of jazz and a rhythmic verve that's positively Gershwin-esque. And like Gershwin's music, it moves easily from cabaret to concert hall." Wladyslaw Szpilman, Polish pianist and composer who had to leave Germany in 1933 after studying with Arthur Schnabel and Franz Schreker. Enjoyed great success in Poland, where his career was abruptly broken off by Germany's attack on Poland in 1939. Survived the Warsaw Getto. Composed about 300 songs, many of which are still popular in Poland today. Wrote a small number of 'serious' works too, which are now available through Boosey & Hawkes / Bote & Bock for the first time. Pre-war compositions include the piano suite The Life of Machines and the Concertino for piano and orchestra that he finished in the getto. His amalgamation of serious and popular music is rooted in the stylistic tradition of the twenties. Should you not be aware of the fact Wladyslaw Szpilman, who died in 2000, was the eponymous Pianist of Roman Polanskis celebrated film and the author of the book from which it derived. The soundtrack of the film has proved durable and Szpilmans own works for piano and orchestra (he was an able composer as well) have been recorded by Sony. So this three-disc set should well have something of a constituency, especially as it fuses some intriguing repertoire, performances and chamber groups. Lets peruse the repertoire first; Chopin, naturally, but also the broadcast premiere of Bacewiczs Second Piano Sonata from 1953; Prokofievs Seventh Sonata in a good performance but also a Jazzmelody (so-called) of Gershwin and Rodgers. The second disc reunites Szpilman with an old and dear colleague of his from before the War, that splendid violinist Bronislaw Gimpel - you might have his Vox box on your shelf with its delectable Bruch, Dvorak and Goldmark concerto recordings. They run through two standard sonatas  Griegs Op.45 and Beethovens Spring - and join in some sparkling morceaux. The third disc is given over to the chamber group of which they were members, the Warsaw Piano Quintet, which toured widely and is here represented by two works; the Schumann and, in a rare outing, the Zarebski Quintet in G.
The solo works go back as far as 1946, the earliest recordings in the set. His Chopin Polonaise-Fantasie is unaffected and patently sincere and the Ballade in F equally attractive. The Bacewicz is a significant piece, dedicated to Szpilman and here in its first broadcast performance. It has plenty of her Prokofiev-derived drive but is none the worse for that and its compact four movement structure (with Baroque indications) demands attention. Theres more Chopin in the shape of the Nocturne in C minor Op. posth. which, despite the so-so broadcast quality, fails to dampen Szpilmans wonderfully singing tone. His own Mazurka is a gentle homage to Chopin and the Old School Friedman and Grunfeld are finely done. He wasnt above a jazzy tune or two  and hed obviously been listening to Teddy Wilson whose stylistic fingerprints loom large in the 1949 Jazzmelody. Szpilman was clearly a musician of significant gifts; we know he gave performances of the big concertos but here we find that he was adaptable and sensitive and a clearly consummate sonata colleague and chamber ally. As a solo player he allied technical command with a warmly singing and rounded tone. Pretty much everything here is well worth hearing  irrespective of whether youve seen the film or not. The booklet is a generous one, with plenty of well-reproduced pictures, promotional material and with a most involving text written by Szpilmans son Andrzej. The only blot is that I find I cant cope with dual texts, English on the left hand page and German on the right. My eye runs on to the next page to meet a flood of umlauts and capitals. But otherwise this three disc set stands the test and is a worthy memorial to Szpilman. Those who have seen The Pianist or read the book upon which the film was based will surely be interested in this well thought-out three-disc set, with extensive notes written by the artists son. Seen by the Polish regime as merely a composer of light music - and, being such, a composer that didnt need to be credited - Szpilman toured widely and also composed some serious music, one example of which is included here, a movement of his until-recently lost toccatina. Some of his other works are on another Sony Classical disc: SK 93516. 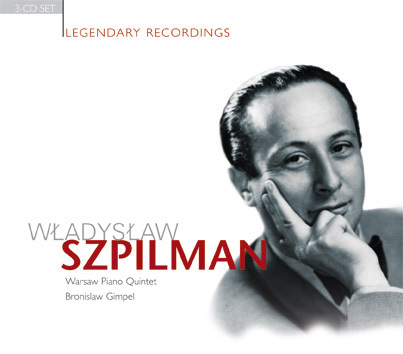 Gleaned from the Polish radio archives, each disc focuses on a facet of Szpilmans career as a musician: as soloist, as performer with his friend Bronislaw Gimpel, and as founding member of the Warsaw Quintet. Being archive recordings, the quality does vary widely, with the Warsaw Quintet disc faring the best. The Schumann quintet is sensitively played, and paired with the unfamiliar G-minor quintet of Zarebski; this is the world premiere recording. The Zarebski, a Romantic composition by a little-known master pupil of Liszt, has a driving scherzo movement that calls forth his teacher and Beethoven both. It is a work that was a pleasant surprise, especially the gorgeous slow movement; an undulating barcarolle of a piece that is an underplayed gem. 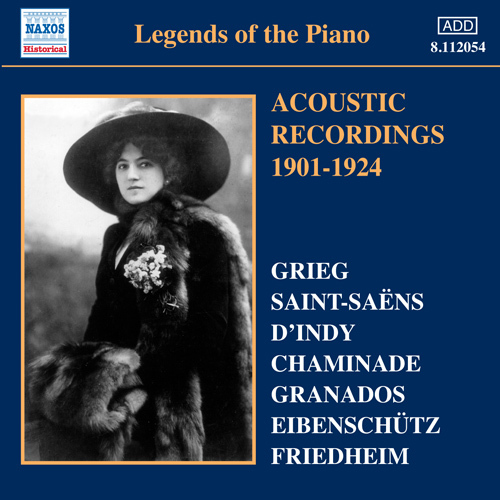 Faring less well in sound quality are the violin and piano pieces with Gimpel. Beethovens Spring sonata Op. 24 has the violin far too prominently placed, and the tone is nasal throughout. The playing is done well, and there are some surprises here as well  the Pastorale and Dance Op. 39 of Karol Rathaus is a showpiece, as is Obertas by Wieniawski. The Rathaus, an enjoyable piece that brings to mind much of the best music of the 1930s for violin, suffers from balance issues. Again, the violin is too prominently placed. In order for the piano to be heard well enough, the volume level of the violin, especially in sforzando and forte passages in the upper register, becomes uncomfortable. Disc one focuses on solo piano broadcasts from 1946 to 1950, the earlier recordings among the first post-war Polish broadcasts. Chopin is, of course, presented, but here, as on the other discs, a wide range of the known and unusual is to be found. His Prokofiev 7th sonata is assured and fluent, the playing angular; the last precipitato movement played slightly slower than the hallmark performances of the piece by Horowitz. Here the focus is more on the structure of the piece rather than as a program-closing barnburner. I feel the Horowitz interpretation is more enjoyable, but Szpilmans viewpoint is an interesting one. Another great surprise is the second sonata of Grazyna Bacewicz, a piece informed at the same time by Chopin and Hindemith  the first movement flirts repeatedly with a waltz but is taken over by agitato passages before quieting down into a piece of uneasy beauty. There are many great moments here, not simply a survey of vintage recordings of works firmly ensconced in the usual canon of pieces to play. Szpilman took risks in his playing as he did in life, and we are fortunate to have this collection, with some of these works available nowhere else. obtained for free (never paid by SONY BMG) from Mr. Andrzej Szpilman under the promiss of promoting the art of Mr. Wladyslaw Szpilman. It appears difficult, indeed impossible, to find a clear place for Wladyslaw Szpilman, the person or his work, in the history of 20th century music. We can only come closer to him by refraining from attempts to categorise him. This is due on the one hand to his remarkable biography: the severity and intensity of the emotional shocks and deprivations that shaped Szpilman, a survivor of the holocaust, exceed anything we would be capable of understanding. On the other hand his musical language reflects the stylistic diversity and undogmatic attitude of the time in which his development as a young man was completed: the late 20sand early 30s of the last century. It is a language that plays with ambiguity, with masks hiding things that were perhaps too much to expect oneself or the sounds to express. 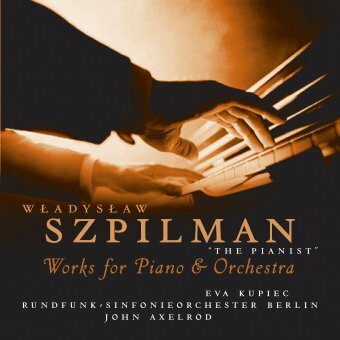 Wladyslaw Szpilman  who was known for a long time outside Poland only as a pianist  was more than a musician, being rather a musicmaker in the emphatic sense of the word. Composing was just one aspect of his diverse work, and doubtless the least known, if we ignore the popularity of his songs. He left a small oeuvre of orchestral and piano compositions that are being made accessible to the public for the first time in this edition, as well as film music and even applied music ranging as far as the opening music for the Polish cinema newsreel. Szpilman did not compose sub specie aeternitatis, but for the moment he was living and experiencing. And that points to an emotional dimension in the background to his work  one that is a little easier to understand after Roman Polanskis film of his memoirs, in which Szpilman narrates his miraculous survival in Warsaw during the Second World War. I say very deliberately: a little. Despite the inspired film and eyewitness reports, we simply cannot come close to imagining a state of living for years in a constant fear of death. It is therefore my view that Szpilman cannot be compartmentalised somewhere within the stylistic genres of the twentieth century, but is rather someone who was able to value the freedom he had regained and to live it. His purview of the various currents in music was very extensive and was not restricted by any doctrine. He composed music to express himself without thinking about whether he was thereby affiliating himself with one particular movement or whether what he was saying would further his career in the marketplace. Instead, music was for him more of an expression of his joy in being alive and not a means of applying learnt techniques. So it is also no surprise that his music is full of positive energy, of an almost resurrection-like character. And that was also what his personality was like when I got to know him, full of jovial cheerfulness, an elderly man whose young spirit never missed an opportunity to crack a joke here and there. I am not speaking here of superficiality! Experiencing a performance of the piano quintet of Grazyna Bacewicz by the Warsaw Piano Quintet he had founded, I was deeply gripped by the modest means with which he as able to create a drama that shook the audience. Everything was authentic, yet "simple" and not "staged". One always had the feeling that the musicians knew precisely what they were playing and why they were on the stage. I am delighted and honoured to recall the unique personality of Wladyslaw Szpilman here for this edition from Boosey & Hawkes. The Pianist had the ring of truth from the ghetto  in large part due to the fact that Szpilmans work was written in 1946. How brave to document his tragedy so soon after it ended. There is an old adage, Those who cant do, review. Its one of those silly sayings about which I wish I could say, Theyre not accurate  theyre just debunking expressions used by people who like to dish. Experience, however, has told me that this expression in particular is a truthful one. Critic Norman Lebrecht suffers from the same ailment as virtually every other critic: They seem to be against everything but for nothing. Lebrechts book, The Maestro Myth, is a case in point. He glories in the demystification and deflation of every great conductor under the sun. The fact, however, remains that it is harder to conduct than it is to write about conductors. Whether he was a good, bad or moderate musician is immaterial to his story. No, in fact, it was perfectly material. Here is a man who was so respected that Jews and Gentiles alike rallied to his defense. Would they have done this for just anyone? What made Szpilman stand out among the millions and millions of other Jews who faced the same fate? Obviously (at least, it would be obvious to one with a rational and healthy mind), Szpilman was a special person with a special talent. failed to mention [Szpilman] either in his memoirs, or (his widow tells me) in any of their conversations. Reich-Ranicki, who knew Szpilman in the ghetto, likewise omits him from his memoirs. None [of the other important Polish musicians] made public acknowledgement of his contribution, if any, to their careers. Lebrecht began his article by saying, In classical music, youve got to be dead to be good. Only two or three composers at any given time achieve posterity while alive. The rest go gently into that good night, praying for posthumous recognition. Why, then, does Lebrecht contradict himself by gloating over his inability to find contemporary kudos for Szpilman? How much contemporary kudos did J. S. Bach garner? As a keyboardist, some. As a composer? Yet another case of Lebrechts illogic and his obsession with desecration. Szpilman did not achieve individual renown. He appears to have been a man with no shadow. J. S. Bach was not renowned until Mendelssohn revived the St. Matthew Passion 77 years after Bachs death. Shadows are not always contemporaneous with the people who cast them. On the other hand, movies tend not to be made about critics lives! Thats why criticism contains more ax-grinding than aural discernment. 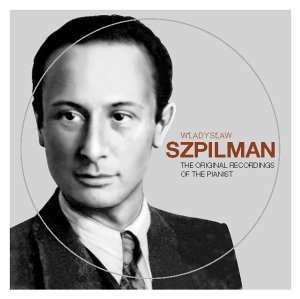 Musical evidence has begun to emerge from the archives of Polish Radio revealing Szpilman as an artist of ironic refinement and restrained muscularity. The evidence does not reveal this. It reveals a musician of the highest order, a Golden Age style composer-musician who seems not to have lost a thing despite six years (!) away from his craft. All that should be there is there: a well-grounded technique, a singing melody, an ear for voicing the harmony, an understanding of the structure of the music, all unified by God-given style and taste. avoid bombast, triumphalism or sentimentality. Is that piece bombastic, triumphal, or sentimental? Perhaps, then, Szpilman was a good interpreter. The pianist can almost be heard to smile when there was nothing to smile about. No, it is Lebrecht who inappropriately smiles. An autographical observation! In the ubiquitous Rachmaninov Prelude in G-sharp he makes no attempt to compete with the fingerpower of Russian masters, but tosses the piece off with nearcasual panache. Incorrect. Szpilman does have fingerpower, which is why the piece sounds easy. How Szpilman maintained that fingerpower during those six unspeakable years shall remain one of the great mysteries of pianism. [The] Sony Classical disc that comes out this week [is] a testament to a shy executant. Shy? Why, because in Chopins Nocturnes he doesnt pour gasoline into the piano and throw a matchin? Szpilman is one of the only pianists in history to capture Chopins dreamy introversion. Or do you prefer Rubinsteins jaded versions that reek of debauchery? Typical critic behavior: Disarm the reader with a seemly complimentary sentence, then whip out the condescension. In the ghetto he composed a Gershwin-like concertino for piano and orchestra, astonishingly cocky in the deadly circumstances. Cocky? Here Lebrecht is making two ridiculous comments  one, that Gershwins music is cocky, two, that Szpilmans is. Is any music that is lighter than Beethovens somehow brash? And what is the relevance of world events? In 1937 America was in a depression, the world was at the brink of war, and Cole Porter suffered an accident that would eventually result in amputation. That didnt stop him from writing songs like Most Gentlemen Dont Like Love, From Now On, and Get Out Of Town. Should he somehow not have been allowed to write light-hearted songs at that time? Naggingly persistent, [the Concertino] is not a particularly likeable piece but it lodges in the ear like a grommet. Its one of those pieces you find yourself humming and wonder where its from. Typical mentality of the 20th-century music critic: If a piece is popular, it must not be good. So if the piece didnt stay in ones ear, would it then qualify as a masterpiece? 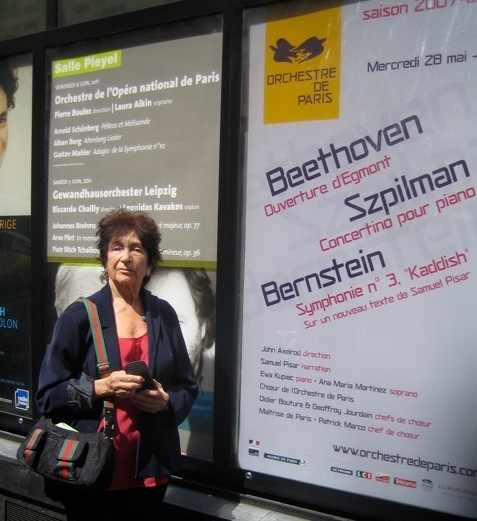 In a year or two, Szpilmans music will be played no more than Góreckis. An easy statement to make, because in a year or two no one will remember Lebrechts review in order to refute it. Copyright © MMIV Leonardo A. Ciampa. All rights reserved. On Sept. 23, 1939, Wladyslaw Szpilman played the last live piano recital heard over Polish radio before it was blown off the air by German bombing. As he recounts in his memoir, Death of a City (the basis of Roman Polanski's film The Pianist ), the shelling was audible during his performance, and so heavy afterward that he had to wait two hours before walking home through the rubble and smoke. That evening, as German artillery again battered Warsaw, Szpilman worked on a Concertino for Piano and Orchestra , pausing at dusk to look out the window to see what new damage had been done in the neighbourhood. "Outside the door of our building," he writes, "lay the corpse of a woman with her head and one arm blown off . . . Her blood flowed into the gutter in a long, dark stream, and then ran on into a drain covered by a grating." Szpilman continued writing his Concertino as the Germans subdued the city and began the repressions that eventually wiped out most of its half-million Jews, including Szpilman's mother, father and three siblings. You can imagine how his fear and apprehension expressed itself in the music he was writing in the family apartment. You can imagine it -- but you won't hear it anywhere in the music. The Concertino , which like Szpilman himself survived the war (he died in 2000 at age 88), is a breezy souvenir of the symphonic jazz age. Blue notes, rag-time rhythms and suave orchestrations suggest the kind of music George Gershwin might have written if, like Szpilman, he had studied with a high-brow German composer like Franz Schreker. Thanks to Polanski's film, Szpilman's tale of survival is now known to millions, and his 1946 memoir, recently published in English in paperback as The Pianist , is a bestseller. His music is also coming to light outside Poland, with a recent American recording of songs featuring Montreal singer Wendy Lands, and a plan by the eminent British music company Boosey & Hawkes to publish Szpilman's piano and orchestral pieces and his 500-odd surviving pop songs. Yes, pop songs. Szpilman apparently spun them out as easy as breathing, before, after and even during the war, when according to his son Andrzej, he worked on a musical that was performed in the Warsaw ghetto. "People were always asking him for songs," said Andrzej, on the phone from Germany. "He was writing them in the coffee bar, in three minutes, between the coffee and the cake. We found some written on napkins, and some of these were big hits." Szpilman hit the charts 150 times in Poland, and several of his songs remain pop standards in that country. This side of his career poses an intriguing contrast to the dreamy Chopin interpreter and a puzzle for those who assume that the events of a composer's life -- especially tragic events -- directly colour the music. Read any program note about a stormy piece by Beethoven or Brahms, and you're almost certain to see a connection made between the tone of the music and the real-life trouble that "inspired" it. And yet counterexamples abound, when composers wrote apparently light-hearted music through periods of grave personal difficulty. Mozart was ill and broke for much of his career, yet that doesn't diminish the buoyant good humour of The Magic Flute . Szpilman had a talent for light music, and none of the horrors he experienced prevented him from exercising it. His Waltzes in the Olden Style evoke the kind of grand ballroom that only ever existed in Hollywood, when Jewish émigré composers such as Erich Korngold and Max Steiner ruled the sound studios. His Ballet Scene is almost a parody of highfalutin European music, in which evocations of French impressionism and Stravinsky's Rite of Spring rub up against the debonair jazz style of the Concertino . These period bonbons are contained on a sampler disc from Boosey, which hopes to place them on orchestral pops programs wherever The Pianist has been seen. But the first effort to bring the songs to a wider public -- Wendy Lands Sings the Music of the Pianist , on Universal's Hip-O label -- goes all out to present Szpilman's music as the sound of the present moment. You may be hard-pressed to imagine these tuneful numbers being written in prewar Poland, or under the Communist regime that prevented Szpilman from travelling abroad during the late forties and early fifties (he later toured widely with the Warsaw Piano Quintet, playing Toronto in 1977). Producer John Leftwich hired writers to devise new English lyrics (not translations), and updated the arrangements -- or rather, back-dated them, to suit the current fashion for well-worn Americana. The style ranges from soft jazz cabaret to a cheeky country mode, with slide guitar riffs and ironic asides on a café violin. Some of these tunes and settings sound like they would suit Norah Jones, though Lands shows a passing vocal resemblance to another Jones -- Rickie Lee. The tunes' Central European origin shows in small things -- a turn of phrase or harmonic shift that fleetingly evokes a vanished world. These could be the songs of a forgotten contributor to the American Songbook. That was apparently the goal. Andrzej Szpilman, who acted as executive producer for the Lands disc, points out that Szpilman's pop music already speaks American, or at least an off-shore dialect. The Jewish European influence was an important element in the formation of an American popular sound (think of Irving Berlin, Jerome Kern and Gershwin) and jazz was common in the Berlin cabarets when Szpilman studied there in the early thirties. Szpilman had a prodigious memory. In a passage near the end of Death of a City , he describes how he spent the last winter of the war hiding in a ruined attic, with no heat and almost no food, staying sane only by going over in his mind "all the compositions I had ever played, bar by bar." When he returned to concert life, his classical repertoire was intact. But he often forgot his songs. "My father never believed in his songs," Andrzej said. "He wrote them and he hated them, especially the hits. He said that the better song is never the hit, and the worse music is always the most popular . . .
"He told me, 'A song is like a butterfly. You write it, you give it away, you forget it.' "
That's almost a credo for the importance of fleeting diversions, which were needed in Warsaw under the Nazis and during the Cold War as much as anywhere else. Polanski didn't have the scope to show it, but as Andrzej points out, the Jewish culture of Warsaw thrived defiantly right up until the first mass deportations in the fall of 1942. Why not put on a musical in the Warsaw ghetto? Why yield anything of your culture, especially when someone else is shouting that it and you are worthless, a contagion in the body of Aryan Europe? 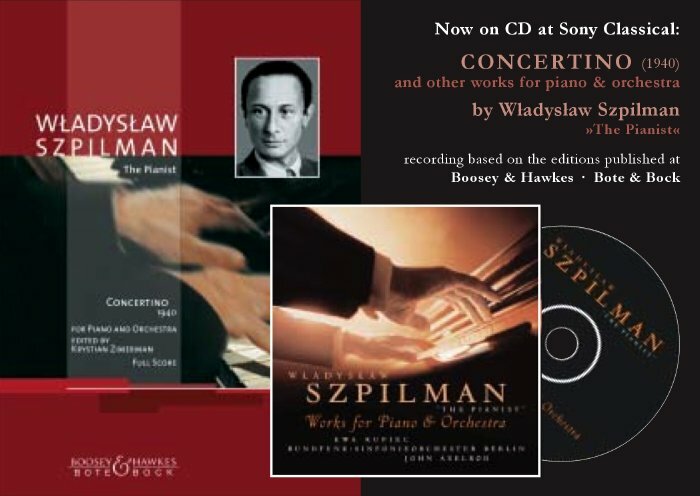 Learn about concert works by Wladyslaw Szpilman published by Boosey & Hawkes order scores, music, contact Boosey & Hawkes publisher etc. Warsaw is in the grip of a mania  Szpilmania, to be precise. The face of Wladyslaw Szpilman stares out at you from bus stops. The papers are full of Szpilman articles. His family seem to be permanent fixtures on radio and TV. The excitement has been caused by Roman Polanski's film The Pianist, winner of the Palme d'Or at the Cannes film festival in February and released this month in Poland (it opens in Britain later this year). It's based on Szpilman's gripping account of his survival of the Warsaw ghetto and his brushes with death in the bombed-out city. The book had made the bestseller lists by the time Szpilman died, aged 88, in 2000; Polanski survived the Krakow ghetto, and Szpilman's tale spoke directly to him. This concert of Szpilman's compositions, which capped celebrations of the composer, illustrated the duality of his musical life. Having studied the piano with Schnabel and composition with Schreker, Szpilman was one of Poland's foremost classical pianists, spending 50 years on the concert platform, but for the harrowing interruption of his incarceration and flight. And yet his musical legacy is largely of lighter music: he composed some 450 popular songs, a selection of which, sung by Irena Santor, formed the second half of the concert. The first half consisted of a bustling, neo-Classical Little Overture, the introduction from his score to the film Calls to My Wife, with soaring string melodies à la Mantovani, a Concertino for piano and orchestra, a Ballet Scene and an ironically sentimental Waltz in the Old Style  the sum total of his orchestral output. The Concertino was written in 1940, in the teeth of the Nazi terror. But the bright and buoyant music betrays nothing of its origins: its blend of classical format and jazzy melodic inflection is Gershwin in the ghetto, the debt to the Rhapsody in Blue obvious. A suite for solo piano from 1933, The Life of Machines, with pounding Bartokian figures in its first movement, a wistful central section, and sardonic, Prokofievan toccata-finale, preceded the Ballet Scene of 1948, a mix of more Gershwin and the Prokofiev of the Scythian Suite, with a soupçon of The Rite of Spring  stomping rhythms obscuring a sense of humour that popped its head up when allowed. Wladyslaw Szpilman will become a household name when Polanski's film is released internationally. So it's a pity he wrote so little for his instrument. Still, the fetching melodies of those hundreds of songs have endeared themselves to the Poles, and we'll doubtless be hearing a lot of them over here, too. "I am happy to give you the original manuscript of your father´s Suita for Piano, (a personal copy 1934 -as) inscribed by your father, Wladyslaw Szpilman to my father, Jakob Gimpel... I feel very privileged to have been able to contribute to the preservation of your father´s memory and work". "Michalowski, whose reputation was towering within Poland but almost non-existent without, received instruction from Karol Mikuli, Karl Tausig, and Ignaz Moscheles, eminent disciples of, respectively, Chopin, Liszt, and Beethoven. From Mikuli he learned Chopins ideas on interpretation; Michalowski likely approximates some aspects of the composers own playing. One pupil, the distinguished pianist/composer Wladyslaw Szpilman (author of The Pianist and subject of the film by the same name), recalled for these notes that Michalowski, nervous and all but blind toward the end of his life, played his scores from memory with a great virtuosity and created a special atmosphere at home. Listeners felt Brahms could knock on the door at any moment."